This is a simple but odd little puzzle. It consists of three semicircles which are hinged together. Each pair of semicircles can be held flat forming a round face, so there are three such faces with a single colour each. Around the edge of each face is a ring four pieces which can rotate around the face. 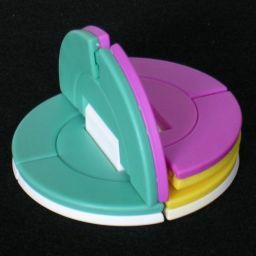 The pieces have two colours, because they have two sides which belong to different faces. There are 6 pieces altogether, in three pairs of identical pieces. Versions with 4 semicircles are slightly more common, and these often have printed designs on them or have unusual colour schemes. This puzzle was patented by Fritz Gruber on 7 December 1993, US 5,267,731. This leaves 6!·22 = 2,880 positions. This number of positions of this version of the puzzle is one of the lowest of all the puzzles in my collection, and yet it is certainly not trivial. None of the positions need more than 9 quarter turns to solve, or 7 face turns (on average, 5.4465 quarter turns or 4.5688 face turns). There is only one position that needs 9 quarter turns, and this is the position with all the pieces flipped. In Sloane's On-Line Encyclopedia of Integer Sequences these are included as sequences A079742 and A079817. If all 6 pieces are distinct, then the puzzle needs up to 12 quarter turns or 10 face turns to solve (on average 7.0585 and 6.0739 moves). There is only one position that needs 12 quarter turns, and as you would expect it is the position with all the pieces flipped. On the version with four faces there are 8 pieces. They seem to have 2 orientations each, but this is not really so since the position of a piece determines its orientation.There means there are at most 8!=40320, and these are indeed all possible. 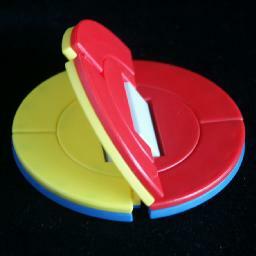 This version can always be solved in 9 quarter turns or 9 face turns (6.6699 and 6.0525 moves on average respectively). On the three face version, denote the faces by L, F, and R, meaning left, front and right respectively. Moves are denoted by the letter of the face involved. Quarter turns clockwise just use the letter, half turns are denoted by a the letter followed by a 2 (e.g. L2, F2, R2) and anti-clockwise turns by the letter with an apostrophe (e.g. L', F', R'). On the four face version we also use L, F, R for the left, front, right faces. Only those three faces are needed - the back face will not be used. This solution was devised by Bram Cohen (with only minor modifications). I will assume that all the pieces are different. Some steps of the solution are not necessary if you are solving the version with three pairs of identical pieces. Phase 1: Orient all the pieces. If a piece can be put into its correct position and orientation by just using the moves F and R, then it is considered correctly oriented, otherwise it is said to be flipped. Find out if any pieces are flipped. If there are none, go to the next phase. Use turns of the Front and Right faces to bring one flipped piece to the top left of the Front face, and one flipped piece to the bottom right of the Right face. This is not hard. Do L', so that the two flipped pieces change to different semicircles. This causes them to be unflipped. Repeat steps a-c until there are no flipped pieces left. Phase 2: Solve two pieces at the front left. Note that we will only use turns of the Front and Right faces in this phase to avoid flipping pieces again. Find the piece that belongs at the top left of the Front face. Use turns of the Front and Right faces to put it at the bottom left of the Front face. Find the piece that belongs at the bottom left of the Front face. If the piece lies at the top left of the Front face, then the sequence F R' F2 R F' will swap the two pieces. Otherwise that piece must somewhere in the right face, so turn Right to bring the piece to the bottom left of the right face (bottom right of the Front face) and then do F to place the two pieces correctly. Phase 3: Solve the last four pieces of the Right face. Turn the Right face so that at least two of its pieces are correct. 1. Turn the Right face to put the two pieces on the left side of that face (i.e. also at the right of the Front face). 2. Do L' F L R' L F to swap them. 3. Turn the Right face to its correct position. 1. Do F R' L' F R L' to swap them. 2. Turn the Right face to its correct position. This solution is very similar to the solution to the 3-face version, except that there is no orientation phase. I will assume that all the pieces are different. Some steps of the solution are not necessary if you are solving a version with some pairs of identical pieces. Phase 1: Solve two pieces at the back left. This phase is very similar to phase 2 of the previous solution. Find the piece that belongs at the top left of the Left face. Use turns of the Left, Front and Right faces to put it at the bottom left of the Left face. Find the piece that belongs at the bottom left of the Left face. If the piece lies at the top left of the Left face, then the sequence L F' L2 F L' will swap the two pieces. Otherwise that piece is somewhere in the front or right faces, so use these faces to bring the piece to the bottom left of the front face (bottom right of the left face) and then do L to place the two pieces correctly. Note that this is exactly the same as phase 2 of the previous solution. 2. Do F R F' RL F' R F L' to swap them. 1. Do F' LR F' LR F' L to swap them.